Hello, my bookworm buddies! I have been rather naughty and have left you in the dark of all the great books I have been reading lately. I am just coming out of a little reading slump and realized I haven’t written and posted any reviews for quite a while. So here are my thoughts on one the books I read last month. I can’t remember where I heard about this book but I remember thinking I needed to buy it. I ordered it used from Thriftbooks.com and this spring seemed like the perfect time to read it. I took a photo of the cover next to my flowers. Carol Wall, a white woman living in a lily-white neighborhood in Middle America, was at a crossroads in her life. Her children were grown; she had successfully overcome illness; her beloved parents were getting older. One day she notices a dark-skinned African man tending her neighbor’s yard. His name is Giles Owita. He bags groceries at the supermarket. He comes from Kenya. And he’s very good at gardening. Before long Giles is transforming not only Carol’s yard but her life. Though they are seemingly quite different, a caring bond grows between them. But they both hold long-buried secrets that, when revealed, will cement their friendship forever. I found this book very easy to get into. I liked hearing Carol’s story and think she did a fantastic job capturing her developing relationship with Mr. Owita. Carol opened up about so much with regard to her cancer and how she viewed herself before and after her diagnosis. 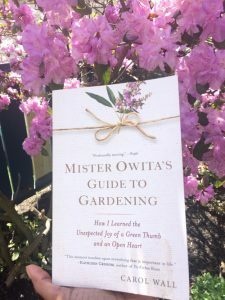 Of course, being a gardener myself, I enjoyed the sprinkling of gardening talk throughout the book. She had a great way of tying the plants and gardening to her story. I don’t typically read reviews about books until I have read and written my own. However, when I was searching to get the synopsis of the book, I stumbled across a very critical review that said that Carol was whiny and I was taken aback. I can’t comprehend what someone going through a cancer diagnosis and treatment is experiencing. Therefore, I would not use the word whiny to refer to their response to a terminal illness. In fact, I found the book to be quite the opposite. I liked how she and Giles’ relationship developed over a slow process into an amazing friendship. I always believe that things happen for a reason and I believe they were meant to meet. I would recommend this book because it is a good way to glimpse into the experience if it is not yours and to find appreciation for your own life. So I will give this book 3 1/2 butterflies.